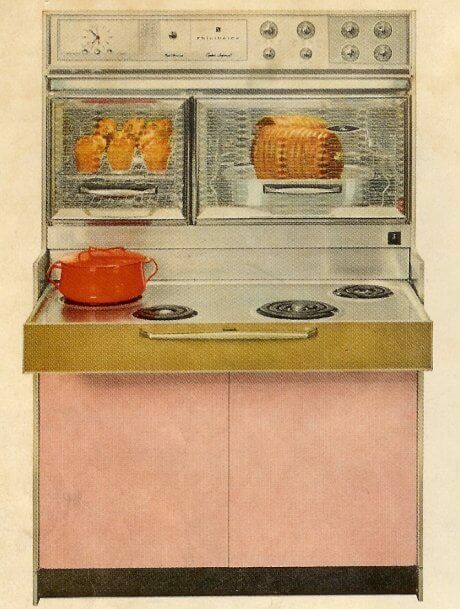 This is a beautiful, classic mid-50s vintage stove, a 1954 Hardwick used in an advertising for gas appliances. I also adore the color scheme in this image: Gold, black and white – with a punch of red. The image also hints at how effective it can be to use just one color as your predominant color – especially if it is strong (in this case, gold) and then rationing the accents. My kitchen also uses this technique – the aqua is so bold, so strong, that if I had used a second color in near-equal measure, the whole thing would have been too loud, too hard on your eyeballs. One more thing: When you are buying/restoring vintage ranges, please do your homework relative to wiring, gas, etc. 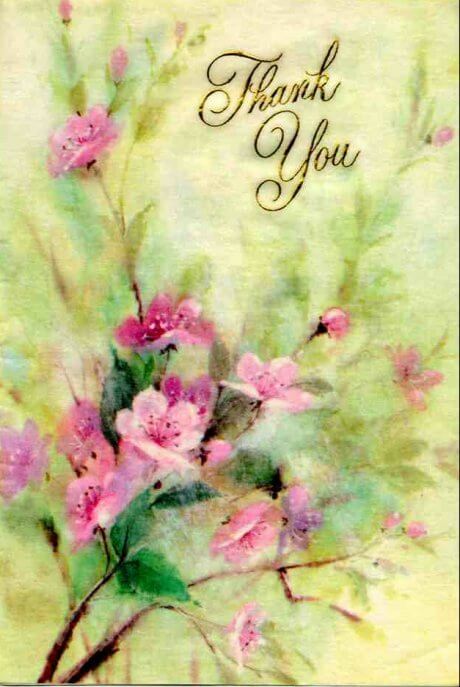 : I recommend you talk to the folks at AntiqueAppliances.com, who seem to have a history in this area. Timely post for me — the big burner on my electric range went snap, crackle, pop yesterday. We do want to replace it with a gas range, but had been not been planning on this purchase until later in the year. First we want to replace the awful kitchen flooring, then get the gas line in place, etc etc — as everyone knows, it’s impossible to change just one thing in a kitchen, you end up having to change several things. But that can be fun! First off, good for you sumacsue! 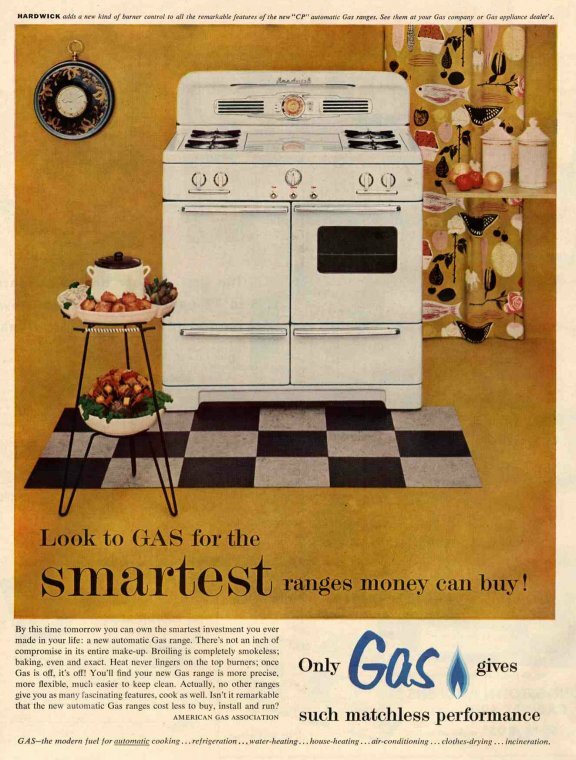 While there are some beautiful electric ranges out there; having grown up with gas ranges, and then setting fire to the kitchen twice with an electric, I can say gas is the only way to go! You know at a glance that you left the burner on with a gas stove! And yes this will most likely lead to what I’ve termed “While I’m at it-itis” and you’ll end up over-budget with a lot more done than you originally planned on; but it is not always a bad thing! On to my original thought which is that I no longer feel I’ve gone too contemporary/tuscany-ish with my kitchen paint color. That seems to be “it” in this picture. Since my house is a ’55 this color actually seems quite period correct even….wow! 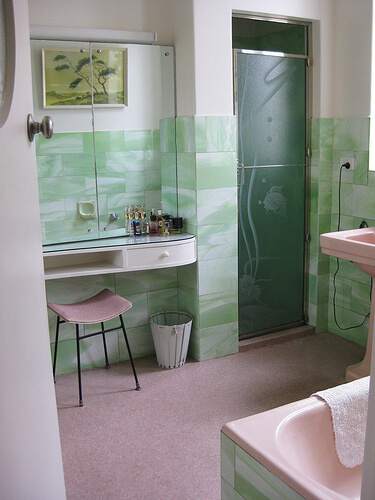 I’m using aqua/teal as my accent color and have almond tiles with black trim and white cabinets with black counter top. Appliances are currently almond and of early 90’s vintage. The vintage will change as time and money allow, but the almond color has grown on me. 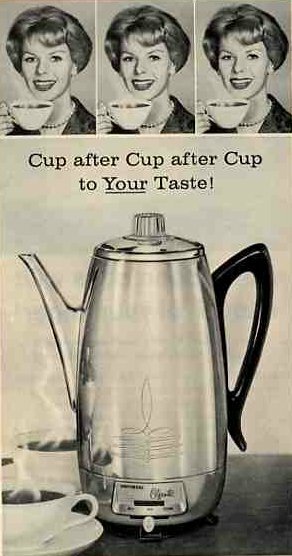 Did they offer almond/bisque on 50’s appliances? The gold is the predominant color and (in my opinion) looks very good. I love that stove! I have always used vintage stoves, have been lucky enough to find them at sales everytime I needed one (whenever we moved). Now, all of a sudden they’re in vogue and I am unable to find a nice one at a decent price. I just might have to splurge and buy one from Vintageantique appliances but it’s a 2-3 day drive to that place. I don’t think I could buy one sight unseen. 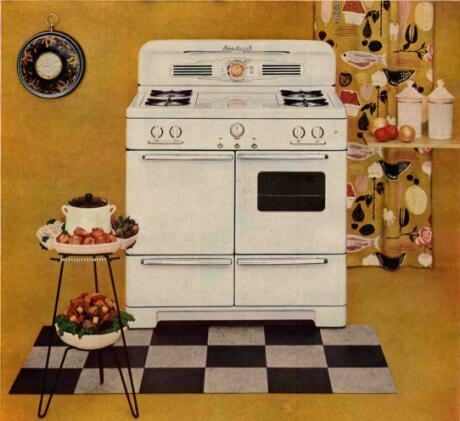 Anyway, I have a nice vintage stove now, but I’d love a double oven like this one. Oh, and it HAS to have a door in the oven! And, yes, gas is the only way to go!